I offer 4 different courses here and all of them are great fun! 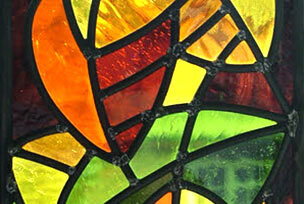 For those of you wanting to try something traditional, my Stained Glass taster day is for you. 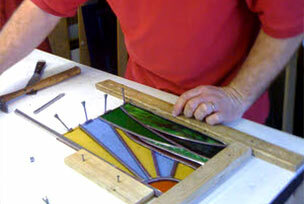 The Next Step two day stained glass course is for those of you who have either completed my one day course or a similar one elsewhere and want to take your lead work further. We can add some painting to our panels on day one if you like and it’s fired over night for you. 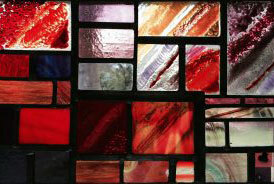 If you want to have a go at making a bowl, plate or contemporary wall panel, a days Fused Glass course will be just right! If you want to come back for more fusing days after your first, you can learn new techniques and more advanced ‘stuff’. I’m keeping a beady eye on new innovations that are coming out and try to get the materials in stock. Copper Foiling is probably the one glassy crafty thing that’s the easiest to do at home, so I have designed a copper foil course for you. 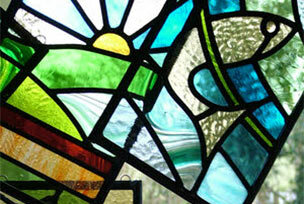 My workshop looks out over the Surrey Hills and is a very inspiring place to learn and have fun. 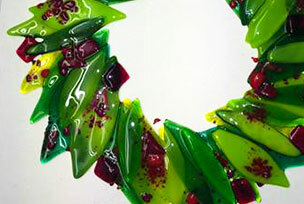 I am very generous with materials on all courses and the fusing glass I use is Bullseye glass made in Portland, Oregon. I just need to tell you that unfortunately you cannot work with lead if you are pregnant or nursing your baby. There will be lots of standing at the bench but of course we have seats for you. I have taught students from 16-80 years old so age is not a problem. You can buy a course as a special gift for someone. 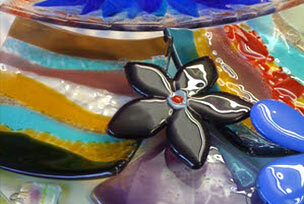 I enclose a little glass gift so as well as the paperwork and gift letter you can give something glassy on the day. Even if no dates are shown on my website I am already compiling and working out the next ones so drop me a line and hopefully I can find you a course. Alternatively the recipient can always phone or email me to arrange the date themselves so you don’t have to commit to a date now. Special days can be organised for groups and 5 is my maximum. I teach a maximum of 4 students at a time to allow you the very best tuition however I am happy to take on larger groups of friends. Just contact me here. On booking you will be sent all the information you need to attend and payment is required on booking please. We have a break for lunch and a chat so please bring some lunch with you. Half day classes run from 9 am to 1 pm. All work has to be collected from the studio.